(AP)—In a film recently made in Nigeria, a man stops a beautiful woman, suavely trying to get her to talk to him. Instead she pouts her lips and looks down at her hands, barely able to hold all of the BlackBerry phones she owns. "If you really want to talk to me, get me a BlackBerry Bold 3 ... then and only then, you can talk to me," the woman says in the now-infamous Nollywood film "BlackBerry Babes," which follows the hijinks of beautiful women in short skirts manipulating their way to getting new mobile phones. For troubled BlackBerry-maker Research In Motion Ltd., the stilted dialogue in Nigerian English sounds like money in the bank. The mobile phones made by RIM hold the dominant market share in both Nigeria and South Africa, two of the biggest economies on the African continent. Now opening an office in Nigeria, RIM hopes to hold onto that African advantage as its sales in Western nations tumble, company officials say. "This is one of the fastest growing mobile markets in the world," said Robert Bose, RIM's regional managing director for the Middle East and Africa. In Nigeria, two out of four smartphones are BlackBerry models, company officials said Tuesday during a news conference in Lagos, citing market research. The number of Nigeria smartphone users is expected to grow from 4 million at the end of 2011 to 25 million at the end of 2016, according to forecasts by Informa Telecoms & Media. How Nigeria became enthralled with BlackBerry begins with the collapse of its state-run telephone company. Fixed, landline telephone numbers now barely exist in Africa's most populous nation with more than 160 million people. Mobile phones now fill that void, with those who can afford it often carrying two or three handsets as networks routinely drop calls. And as the nation's power supply remains erratic at best and people work a variety of jobs, the hard-keyed BlackBerry fills the void left by the absence of functional offices. The phones' prices also make ownership a sign of status as well in a nation where most earn less than $2 a day. Business partners routinely communicate over BlackBerry's message service and the young incessantly share their gossip. "I think people equate having a BlackBerry to a certain level of success," Bose said. For some, BlackBerry remains the only constant means of accessing the Internet, while 94 percent of phone owners regularly use its messaging service, the officials said. 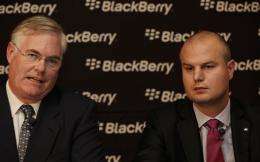 The Nigerian and African experience for RIM comes as the mobile phone manufacturer faces tougher times elsewhere. RIM's software is still focused on email, and is less user-friendly and agile than iPhone or Android. The company's attempts at touch screens largely failed and its applications lag behind its competitors. RIM's U.S. share of the smartphone market dropped from 44 percent in 2009 to 10 percent in 2011 according to market researcher NPD Group. The company still has 78 million active subscribers worldwide. 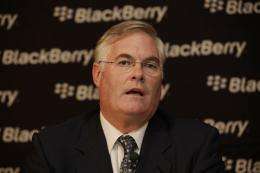 "There's been a tectonic shift" away from hard key BlackBerry phones in North America to touch screen phones, Bose said. To halt a similar march here, Bose and others announced they will open an office in Lagos, as well as set up operations around the country to allow users to come in and update their phones' software for free. The company also has plans to offer applications for sale by having mobile phone carriers bill the user, rather than require credit cards, said Waldi Wepener, RIM's regional director for East, Central and West Africa. Yet challenges remain. In Nigeria, the government currently faces a growing threat from a radical Islamist sect and secret police routinely watch and harass opposition leaders and journalists. Bose repeatedly declined to say whether Nigeria had asked for access to information from BlackBerry or demanded servers be set up in the country to monitor traffic. Other nations in the past have made similar demands of RIM. Some messages may still be encrypted, so it's not clear what nations could pull from it. For now, though, RIM hopes to continue ride on its wave of popularity in Africa. And for the film "BlackBerry Babes," Bose simply said: "We're actually flattered by it."